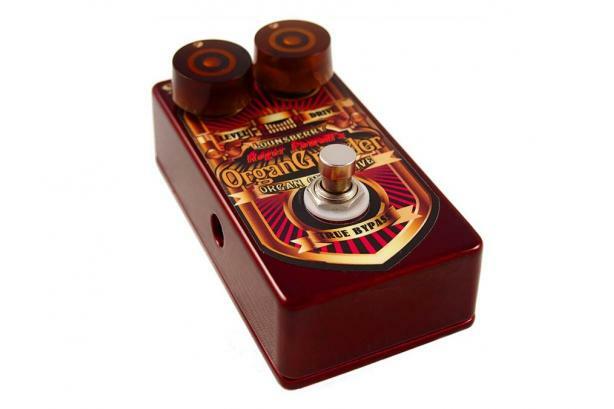 The Organ Grinder is a true bypass, multi stage overdrive that uses FETs to simulate vacuum tubes, and germanium diodes in the clipping stage. That feeds into the input stage of the final FET amp that gets FAT as it saturates. The package is finished off with custom Steam Punk Graphics by artist, Mark Hershberger, with Gold Speed Knobs over a candy apple red powder coated enclosure. If you play organ, electric piano, or synth, and are tired of using guitar pedals with their characteristic mid-range hump, and are looking for an overdrive with wide, flat frequency response designed specifically for keyboards, this is the pedal for you. This one can handle your bass notes.